R.A. Torrey (1856-1928) was a Congregational evangelist, teacher, author, born in Hoboken, New Jersey. He was educated in Yale University and Divinity School. After a period of skepticism he trusted in Jesus Christ as Saviour. Soon after he pastored in Ohio and then in Minnesota. 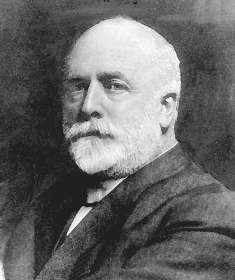 In 1889 Dwight L. Moody called Torrey to Chicago to become the superintendent of the school which became known as the Moody Bible Institute. He also served as pastor of the Chicago Avenue Church, now the Moody Memorial Church, for twelve years. 1. For the conversion of the unsaved. A tract will often succeed in winning a man to Christ where a sermon or a personal conversation has failed. There are a great many people who, if you try to talk with them, will put you off; but if you put a tract in their hands and ask God to bless it, after they go away and are alone they will read the tract and God will carry it home to their hearts by the power of the Holy Ghost. One of our students wrote me in great joy of how he had at last succeeded in winning a whole family for Christ. He had been working for that family for a long time but could not touch them. One day he left a tract with them, and God used that tract for the conversion of four or five members of the family. Another student held a cottage meeting at a home, and by mistake left his Bible there. There was a tract in the Bible. When he had gone, the woman of the house saw the Bible, picked it up, opened it, saw the tract and read it. The Spirit of God carried it home to her heart, and when he went back after the Bible she told him she wanted to find the Lord Jesus Christ. The tract had done what he could not do in personal work. I once received a letter from a man saying, "There is a man in this place whom I tried for a long time to reach but could not. One day I handed him a tract, and I think it was to the salvation of his whole family. 4. To set Christians to work. Our churches are full of members who are doing nothing. A well-chosen tract may set such to work. I know of a young man who was working in a factory in Massachusetts. He was a plain, uneducated sort of fellow, but a little tract on personal work was placed in his hands. He read it and re-read it, and said, "I am not doing what I should for Christ." He went to work among his companions in the factory, inviting them to the church, and to hear his pastor preach. Not satisfied with this, he went to doing personal work. 1. To begin a conversation. One of the difficulties in Christian work is to begin. You see a person with whom you wish to talk about the Lord Jesus Christ. The great difficulty is in starting. It is easy enough to talk after you have started, but how are you going to start a conversation naturally and easily? One of the simplest and easiest ways is by slipping a tract into the person's hand. After the tract has been read, a conversation naturally follows. I was once riding in a crowded car. I asked God for an opportunity to lead some one to Christ. I was watching for the opportunity for which I had asked, when two young ladies entered. I thought I knew one of them as the daughter of a minister. She went through the car looking for a seat, and then came back. As she came back and sat down in the seat in front of me, she bowed, and of course I knew I was right as to who she was. I took out a little bundle of tracts, and selecting one that seemed best adapted to her case, I handed it to her, having first asked God to bless it. She at once began to read and I began to pray. When she had read the tract, I asked her what she thought about it. She almost burst into tears right there in the car, and in a very few moments that minister's daughter was rejoicing in the Lord Jesus Christ as her personal Saviour. As she afterwards passed out of the car, she said, "I want to thank you for what you have done for me in leading me to Christ."